The Bulletin of the Atomic Scientists is a nonprofit organization concerning science and global security issues resulting from accelerating technological advances that have negative consequences for humanity. The Bulletin publishes content at both a free-access website and a bi-monthly, nontechnical academic journal. The organization has been publishing continuously since 1945, when it was founded by former Manhattan Project scientists as the Bulletin of the Atomic Scientists of Chicago immediately following the atomic bombings of Hiroshima and Nagasaki. The organization is also the keeper of the internationally recognized Doomsday Clock, the time of which is announced each January. One of the driving forces behind the creation of the Bulletin was the amount of public interest surrounding atomic energy and rapid technological change at the dawn of the Atomic Age. In 1945 the public interest in atomic warfare and weaponry inspired contributors to the Bulletin to attempt to inform those interested about the dangers of the nuclear arms race they knew was coming and about the destruction that atomic war could bring about. To convey the particular peril posed by nuclear weapons, the Bulletin devised the Doomsday Clock in 1947, with an original setting of seven minutes to midnight. In the 1950s, the Bulletin was involved in the formation of the Pugwash Conferences on Science and World Affairs, annual conferences of scientists concerned about nuclear proliferation, and, more broadly, the role of science in modern society. The founder and first editor of the Bulletin of the Atomic Scientists was biophysicist Eugene Rabinowitch (1901–1973). He founded the magazine with physicist Hyman Goldsmith. Rabinowitch was a professor of botany and biophysics at the University of Illinois and was also a founding member of the Continuing Committee for the Pugwash Conferences on Science and World Affairs. In addition to Rabinowitch and Goldsmith, contributors have included: Morton Grodzins, Hans Bethe, Anatoli Blagonravov, Max Born, Harrison Brown, Stuart Chase, Brock Chisholm, E.U. Condon, Albert Einstein, E.K. Fedorov, Bernard T. Feld, James Franck, Ralph E. Lapp, Richard S. Leghorn, J. Robert Oppenheimer, Lord Boyd Orr, Michael Polanyi, Louis Ridenour, Bertrand Russell, Nikolay Semyonov, Leó Szilárd, Edward Teller, A.V. Topchiev, Harold C. Urey, Paul Weiss, James L. Tuck, among many others. In 1949, the Educational Foundation for Nuclear Science incorporated as a not-for-profit 501(c)(3) organization to serve as the parent organization and fundraising mechanism of the Bulletin. In 2003, the Board of Directors voted to change the foundation's name to Bulletin of the Atomic Scientists. The Bulletin of the Atomic Scientists began as an emergency action undertaken by scientists who saw urgent need for an immediate educational program about atomic weapons. The intention was to educate fellow scientists about the relationship between their world of science and the world of national and international politics. A second was to help the American people understand what nuclear energy and its possible applications to war meant. The Bulletin contributors believed the atom bomb would only be the first of many dangers. The aim of the Bulletin was to carry out the long, sustained effort of educating people about the realities of the scientific age. The Bulletin of the Atomic Scientists seeks to educate citizens, policy makers, scientists, and journalists by providing non-technical, scientifically sound and policy-relevant information about nuclear weapons, climate change, and other global security issues. The Bulletin also serves as a reliable, high-quality global forum for diverse international opinions on the best means of reducing reliance on nuclear weapons. Since its inception in 1945, the Bulletin has sought to educate the American public of the continual danger posed by nuclear weapons and other global dangers, most recently adding climate change and disruptive technologies in the life sciences to the list of concerns. The Bulletin's leadership consists of three boards, and it was announced on October 25, 2018 that California Governor Jerry Brown is joining the organization as executive chair. The Bulletin's Board of Sponsors is composed of accomplished science and security leaders from around the world. Members of the Board of Sponsors weigh in on critical issues, including the setting of the organization's Doomsday Clock. As of October 2018, the Bulletin's Board of Sponsors lists 14 Nobel Laureates. The Bulletin’s Science and Security Board is composed of globally-recognized leaders who have specific areas of expertise in nuclear risk, climate change, and disruptive technologies. Members of the Science and Security Board provide the Bulletin organization and editorial staff with perspectives on trends and issues in their respective fields. Among their duties is the annual setting of the Doomsday Clock, with input from the Board of Sponsors. The Bulletin’s Governing Board concerns itself with the “strategic direction of the organization” as well as legal and ethical considerations. The Bulletin's logo of the Doomsday Clock. Once the Soviet Union developed atomic weapons, the concern surrounding the world's destruction was a great fear of the scientists working on the Bulletin. The proximity of nuclear devastation was a popular interest and, as a result, Bulletin co-editor Hyman Goldsmith asked landscape artist Martyl Langsdorf to create a cover for the June 1947 magazine. Langsdorf, who was married to Manhattan Project physicist Alexander Langsdorf, first considered using the symbol for uranium but then realized that a clock would better convey "a sense of urgency." The resultant Doomsday Clock, which only has bullets labeling the numbers in the upper left hand corner, has been featured on the cover of the Bulletin many times since its creation. The proximity of the minute hand to midnight has been the Bulletin leadership's way of warning the public about manmade threats to humanity; the Clock is a metaphor, not a prediction. When it began in 1947, the minute hand was 7 minutes to midnight; in 1953, when the Soviet Union continued to test more and more nuclear devices, it was 2 minutes to midnight. 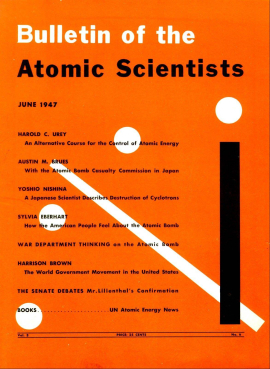 This proximity to midnight of the Doomsday Clock during the early 1950s shows the concern that the Bulletin contributors had about the Soviet Union and the nuclear arms race. The warnings of the Bulletin continued throughout the 1950s and 1960s, and the focus of the efforts shifted slightly from warning about the dangers of nuclear war to the necessity of disarmament. In 2007, the leadership began taking anthropogenic climate change into account in its Clock discussions. Throughout the history of the Doomsday Clock, it has moved closer to midnight, and farther away, depending upon the status of the world at that time. The Doomsday Clock has been getting closer to midnight since 1991, when it was set to 17 minutes to midnight after the superpowers reached agreement on a nuclear arms reductions. As of January 24, 2019, the Doomsday Clock stands at 2 minutes to midnight. The decision to move the hand of the Clock is made by the Bulletin's Science and Security Board, which meets in person twice a year, with subcommittees meeting more often; the announcement of the decision is made each January. Each November, just prior to the Science and Security Board's fall discussion, the Bulletin hosts an annual dinner and meeting in Chicago; both events are open to the public. Reflecting international events dangerous to humankind, the Clock's hand has been adjusted 23 times since its inception in 1947, when it was initially set to seven minutes to midnight (11:53pm). In more recent years, articles of the Bulletin have focused on many topics, ranging from the dangers of radiation following the Chernobyl disaster to the impact of the fall of the Soviet Union. In the wake of the Soviet Union's collapse, other articles have focused on issues such as military spending and the continued funding of missile defense systems designed to thwart nuclear attacks but that in reality may not work. With the ever-growing number of nuclear power plants and the demand for nuclear energy as a solution to climate change, the publication has focused a great deal on the costs and problems surrounding nuclear energy. In 2015, the Bulletin of the Atomic Scientists unveiled the Nuclear Fuel Cost Calculator. Although the arms race and the Cold War, which were focuses of the Bulletin for many of the earlier years, are no longer occurring, the publication still focuses on the nuclear dangers that exist in the world today. As more countries such as Pakistan and India have tested nuclear weapons, the Bulletin has focused on the dangers posed by these countries. The Bulletin's bi-monthly "Nuclear Notebook" is written by Federation of American Scientists experts Hans Kristensen and Matt Korda and tracks the number of nuclear weapons in the world by country. Robert "Stan" Norris, who was a founding co-author of the Nuclear Notebook, retired from the Notebook in 2018, although he is still a senior fellow at FAS. In 2015, the Bulletin added the Nuclear Notebook Interactive, an infographic that illustrates which countries have nuclear weapons and when they got them, and how many nuclear warheads they have in any given year. All nine nuclear-armed states are featured: the United States, Russia, China, India, Pakistan, France, Britain, Israel, and North Korea. In the 21st Century, articles have covered threats to humanity from a variety of sources. The potential dangers of nuclear weapons and energy, military and political developments in the Post-Cold War world, political unrest in the Middle East (and its attendant potential for proliferation risks of nuclear and chemical weapons), myriad negative consequences of climate change, cyber warfare, and changes wrought by emerging technologies have all been examined in the Bulletin in the most recent years. Examples include North Korea, Middle East, Syria, Fukushima, Cybersecurity, and Climate Change. In January 2015, longtime Executive Director and Publisher Kennette Benedict retired. Rachel Bronson took over as president and CEO of the organization. The editor of the Bulletin is John Mecklin. As part of the Bulletin's work to engage new audiences in issues related to nuclear threats, climate change, artificial intelligence, and biological threats, the publication launched its Next Generation Initiative to encourage young and emerging scholars to engage on these pivotal issues. Programs under the initiative have included writing workshops for graduate and undergraduate students, as well as the Voices of Tomorrow feature, which publishes articles and multimedia projects from emerging scholars and experts working in the Bulletin's interest areas. Two Voices of Tomorrow authors, Emma Bastin and Yangyang Cheng, had their work republished in Teen Vogue. The capstone of the initiative is the Leonard M. Rieser Award, selected each December by the Bulletin’s editorial team from among the year's Voices of Tomorrow submissions. The recipient of the Rieser Award receives $1,000 and a subscription to the Bulletin’s bi-monthly magazine. In 2018, Erin Connolly and Kate Hewitt shared the award for their article “American students aren’t taught nuclear weapons policy in school. Here’s how to fix that problem.” Recent recipients include Yangyang Cheng, Nikita Perumal and Moritz Kütt. The Bulletin has had a public-access website available online for some years, with a subscription magazine that comes out 6 times per year and is currently published by Taylor & Francis Online. An e-newsletter is also available without charge by signing up via the Bulletin website. Backfiles of the subscription magazine are available in the John A. Simpson Collection. The backfile from the first (1945) issue through the November 1998 issue of the Bulletin has also been made available free of charge via Google Books. November/December 2008 was the last print edition of the Bulletin, which became all-digital only that year. SAGE Publications began publishing the Bulletin's subscription magazine in September 2010; Taylor & Francis took over from Sage in January 2016. The journal is abstracted and indexed in the Journal Citation Reports, which states that the journal has a 2016 impact factor of 0.452, ranking it 71st out of 83 journals in the category "International Relations" and 32nd out of 41 journals in the category "Social Issues". The records of the Bulletin are kept at the Special Collections Research Center of the University of Chicago Library. ^ "John Mecklin to succeed Mindy Kay Bricker as Editor of the Bulletin of the Atomic Scientists". Bulletin of the Atomic Scientists. 2013-12-10. ^ Wall, C. Edward (October 1975). "The Bulletin of the Atomic Scientists". Serials Review. 1 (4): 11–15. doi:10.1080/00987913.1975.10762958. ^ "Timeline". The Bulletin of the Atomic Scientists. January 2017. ^ "It is 2 minutes to midnight". Bulletin of the Atomic Scientists. ^ Benedict, Kennette (2013-07-18). "Existential Threats, Fast and Slow". Bulletin of the Atomic Scientists. Retrieved July 18, 2013. ^ Goldenberg, Suzanne (January 10, 2012). "Doomsday Clock ticks one minute closer to midnight". The Guardian. ^ "Doomsday Dashboard". Bulletin of the Atomic Scientists. ^ "Science and Security Board". Bulletin of the Atomic Scientists. ^ "Board of Sponsors". The Bulletin of the Atomic Scientists. March 30, 2017. ^ Grodzins, Morton; Rabinowitch, Eugene, eds. (1963). The Atomic Age: Scientists in National and World Affairs. New York: Basic Book Publishing. p. xv. ^ "Would the United States ever actually use nuclear weapons?". Bulletin of the Atomic Scientists. 2013-09-17. ^ "Doomsday Clock FAQ". Bulletin of the Atomic Scientists. ^ Benedict, Kennette (2018-01-26). "Doomsday Clockwork". The Bulletin of the Atomic Scientists. ^ a b Bulletin Staff. "Doomsday Clock Timeline". Bulletin of the Atomic Scientists. ^ "Annual Dinner and Meeting". Bulletin of the Atomic Scientists. ^ Kingston, Reif (2013-10-25). "Pentagon Pushes for Billions to Refurbish Nuclear Bombs". Bulletin of the Atomic Scientists. Retrieved October 25, 2013. ^ Podvig, Pavel. "Shooting Down the Star Wars Myth". Bulletin of the Atomic Scientists. Retrieved April 30, 2013. ^ Miller, John (2013-09-11). "A False Fix for Climate Change". Bulletin of the Atomic Scientists. Retrieved September 11, 2013. ^ "Introducing the Nuclear Fuel Cycle Cost Calculator". Bulletin of the Atomic Scientists. 2015-05-31. ^ Siddharth Mallavarapu; Jaime Aguirre Gómez; Robert Mtonga. "Nuclear Detonations: Contemplating Catastrophe". Bulletin of the Atomic Scientists. Retrieved September 12, 2013. ^ Vishwanathan, Arun (2013-08-09). "Nuclear Signals in South Asia". Bulletin of the Atomic Scientists. Retrieved August 9, 2013. ^ Hans Kristensen; Robert S. Norris. "Nuclear Notebook". Bulletin of the Atomic Scientists. Retrieved May 17, 2013. ^ "Nuclear Notebook". Bulletin of the Atomic Scientists. ^ Siddharth Mallavarapu; Jaime Aguirre Gómez; Robert Mtonga. "Nuclear Detonations: Contemplating Catastrophe". Bulletin of the Atomic Scientists. Retrieved September 20, 2013. ^ Barzashka, Ivanka (2013-10-31). "Converting a civilian enrichment plant into a nuclear weapons material facility". Bulletin of the Atomic Scientists. Retrieved October 31, 2013. ^ Gubrud, Mark (2013-09-20). "US Killer Robot Policy: Full Speed Ahead". Bulletin of the Atomic Scientists. Retrieved September 20, 2013. ^ Duff-Brown, Beth (April 5, 2013). "Interview with Siegfried Hecker: North Korea complicates the long-term picture". Bulletin of the Atomic Scientists. ^ Salsabili, Mansour; Eiran, Ehud; Malin, Martin B.; Khalil, Ayman (June 21, 2013). "Banning WMD from the Middle East". Bulletin of the Atomic Scientists. ^ Walker, Paul (2013-09-13). "How to Destroy Chemical Weapons". Bulletin of the Atomic Scientists. Retrieved September 13, 2013. ^ Blair, Charles (August 26, 2013). "The Chemical Weapons of Syria". Bulletin of the Atomic Scientists. ^ Suzuki, Tatsujiro. "Suzuki's Fukushima Updates". Bulletin of the Atomic Scientists. Retrieved October 26, 2013. ^ Brenner, Joel (September–October 2013). "Eyes Wide Shut: The Growing Threat of Cyber Attacks on Industrial Control Systems" (PDF). Bulletin of the Atomic Scientists. 69 (5): 15–20. doi:10.1177/0096340213501372. ^ Carlson, Robert (2013-12-11). "From National Security to Natural Security". Bulletin of the Atomic Scientists. Retrieved December 11, 2013. ^ Bronson, Rachel (2015-03-17). "A Message to our Community". Bulletin of the Atomic Scientists. ^ "Bulletin Staff". Bulletin of the Atomic Scientists. Retrieved July 20, 2013. ^ Bulletin Staff. "Leonard M. Rieser Award". The Bulletin of the Atomic Scientists. ^ Cheng, Yangyang (April 4, 2017). "Let science be science again". Bulletin of the Atomic Scientists. ^ "The value in activism: Reflections from the Columbia University climate sit-in". Bulletin of the Atomic Scientists. May 12, 2016. Retrieved July 26, 2017. ^ "Arms-control lessons from the Volkswagen scandal". Bulletin of the Atomic Scientists. November 5, 2015. Retrieved July 26, 2017. ^ "Newsletter". Bulletin of the Atomic Scientists. Retrieved September 7, 2013. ^ "John A. Simpson Archive". Bulletin of the Atomic Scientists. Retrieved July 20, 2013. ^ "1945–1998 Bulletin backfile available via Google Books". Bulletin of the Atomic Scientists. December 10, 2008. Archived from the original on December 12, 2008. ^ "Bulletin magazine goes all-digital in 2009". Bulletin of the Atomic Scientists. November 19, 2008. Archived from the original on December 19, 2008. ^ Staff writer (December 15, 2015). "The Bulletin of the Atomic Scientists will now publish with Routledge, Taylor and Francis Group". Bulletin of the Atomic Scientists. Retrieved January 24, 2016. ^ "Journals Ranked by Impact: International Relations and Social Issues". 2016 Journal Citation Reports. Web of Science (Social Sciences ed.). Thomson Reuters. 2017.